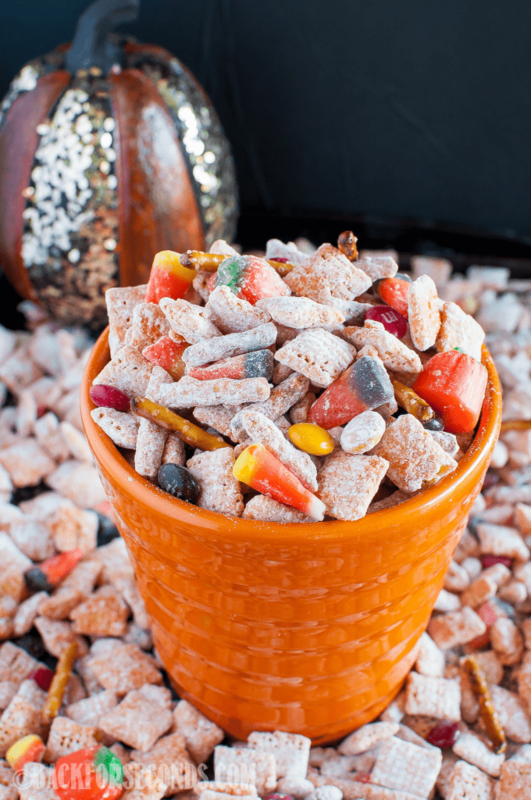 Halloween Pumpkin Spice Muddy Buddies are fun and easy to make, and are the perfect festive, sweet and salty snack for Halloween or fall holiday parties! 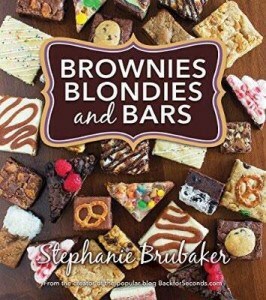 Get my cookbook, Brownies, Blondies, and Bars here (makes a great gift!)! 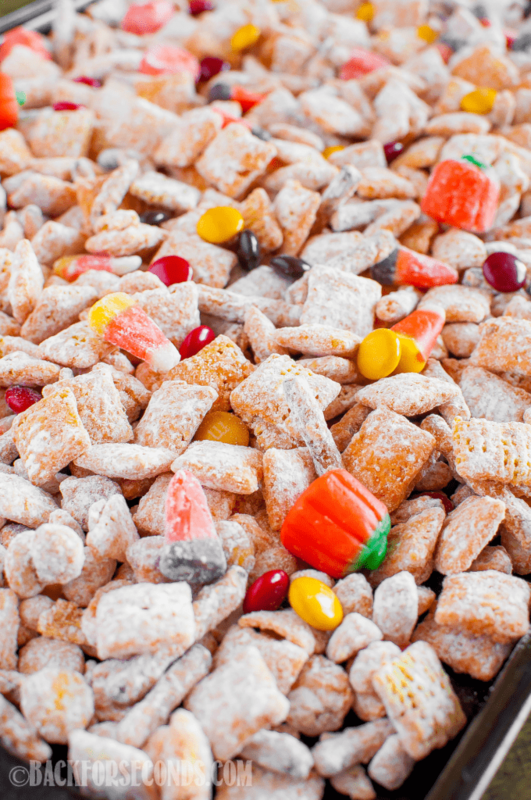 Well, if we’re going to pumpkin spice alllll the things, you had to know muddy buddies were coming! I don’t know anyone who can resist this fun snack, and now it’s all jazzed up for fall! 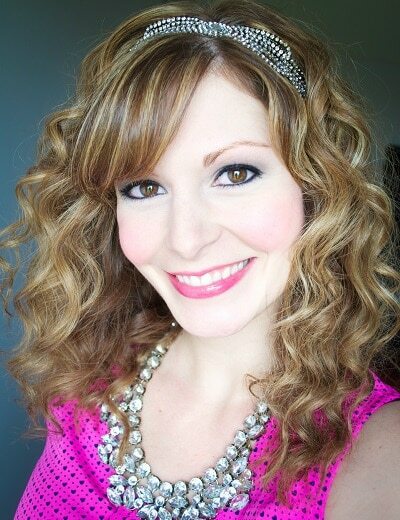 Perfect for parties, movie nights, and just because! Since our twins started kindergarten this fall (and our daughter started 3rd grade), we now have 3 kids in school. Pretty much every Friday night they have a sleepover and movie night together (it’s adorable). Their snack of choice during the movie alternates between popcorn and muddy buddies. These Lemon Pie Muddy Buddies and S’mores Muddy Buddies are always crowd pleasers! My two youngest boys helped me make this while the “big” kids were at school, and boy, did their eyes light up when they came home and saw this! 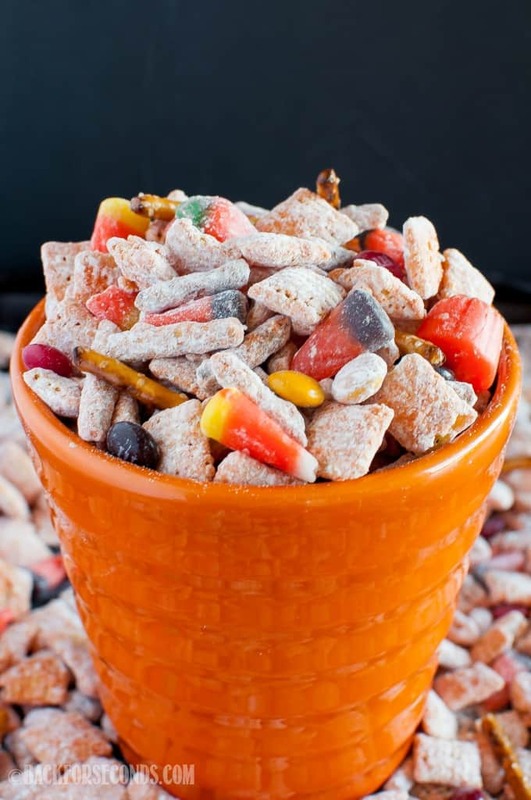 Right away they asked if they could have a movie night and each have their own bowl of this Halloween Pumpkin Spice Muddy Buddies snack mix. How could I say no? I may take some heat for this, but normally I do not like candy corn. I think it’s fun and cute, but really don’t like eating it. However, the saltiness from the pretzels and peanuts totally balanced out the sweetness of the candy corn and even I enjoyed this snack!! Plus it just looks so festive! Make a batch and put it in a pretty bowl, and watch it disappear! Looks yummy! I am gonna make this recipe for our coming holiday parties.